Blog: Warm, Breezy Today. Car Wash On Saturday? Yesterday was pretty nice out! We had a lot of sunshine, but it was definitely cooler near the shore and warmer inland. That was due to an easterly breeze that was blowing in off of the water. We hit some mid 70s inland and there were some 60s near the shore. Today, high pressure is moving farther to the northeast. This is going ot allow the winds to pick up out of due south. Some of the gusts could reach 30 mph. It's crazy off to our west today. Snow is still falling in Minnesota north of a big area of low pressure. Severe storms may occur between Texas and Mississippi. 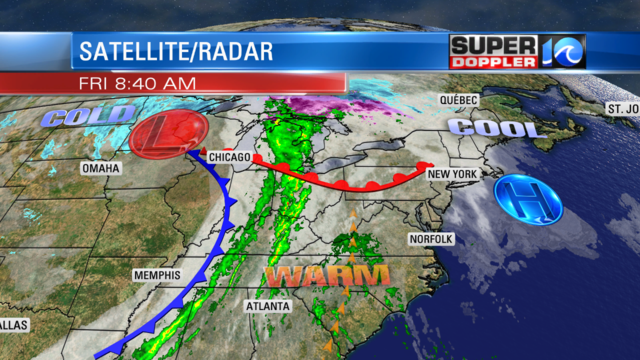 Locally the moisture and temperatures will rise today. Dew points will increase to near 60. Temperatures will top off in the upper 70s with some 80s inland/south. We'll have partly cloudy skies. There will be some isolated showers in a few of our inland/western locations, but I think the bulk of the area will be rain free today. Pollen levels are very high. It's about as bad as it gets during allergy season. I'd say its a 10 out of 10 right now. We'll have some rain showers move in later tonight. Then tomorrorw we'll have quite a bit of rain showers. Especially in the first half of the day. It will be a free (and much needed) car wash for the region. This will temporarily clean out the pollen. Showers will probably taper off by the afternoon. It will still be warm, and it will be muggy tomorrow with highs in the 70s. We'll have less of a chance for rain on Sunday. We'll see a mix of sun and clouds with some hit-or-miss showers. High temps will be near 80. A big cold front will move in between Sunday night and Monday morning. 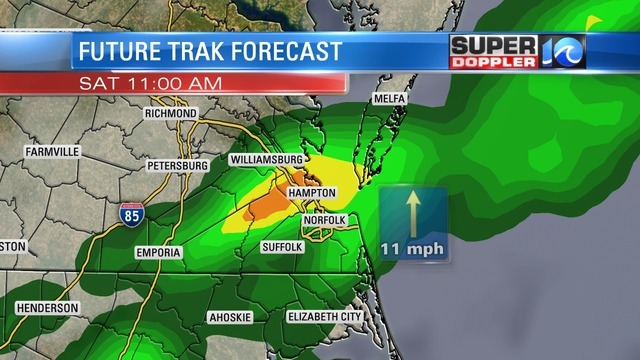 We'll have lots of rain to start the day, and possibly a few thunderstorms. Then we'll dry out by the afternoon. High temps will drop to the low 70s. We'll be mild and dry through Thursday. Stay tuned for updates.